The 1684 ‘Croall, McEwen’ Antonio Stradivari violin sold for £1.92 million at Ingles & Hayday on 28 March 2017. The final sale price was just under the upper guide price of £2 million. The auction took place at Sotheby’s galleries in New Bond Street, London. According to the auction house, the ‘Croall, McEwen’ is in ‘fine condition’. Its back is crafted from a single piece of maple with irregular flame and the instrument ‘represents a key stage in the development of the luthier’s distinctive style’. Violinists who have previously performed on the instrument include Frank Peter Zimmermann (1985–90) Alexander Gilman (2006–08), and Suyeon Kim (since 2011). All of Zimmermann’s recordings on the EMI Classics and Warner Classics labels during this period were performed on the ‘Croall, McEwen’. The instrument is named after William Croall, the son of a family of carriage makers, who bought the violin in 1885/86. 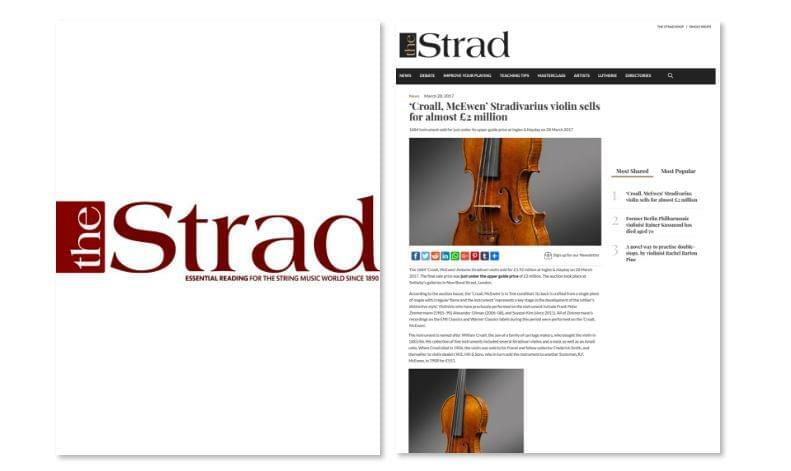 His collection of fine instruments included several Stradivari violins and a viola, as well as an Amati cello. When Croall died in 1906, the violin was sold to his friend and fellow collector Frederick Smith, and thereafter to violin dealers W.E. Hill & Sons, who in turn sold the instrument to another Scotsman, R.F. McEwen, in 1908 for £553.